Still digging through the survey results from the end of March 2017. This time, we’ll look at how Linux gamers’ choice of Distro for Gaming (and probably other purposes for most of us) has evolved compared to last year. Let’s go directly to the results, showing only the distributions with more than 1% of users in 2017, in red (in black, the results from 2016). Ubuntu remains the first distro used for gaming (note that is includes the different variants of Ubuntu). If you count its derivatives like Linux Mint (directly based on Ubuntu stable), you get about 43% of Linux gamers on that platform. At first it seems like Arch Linux is losing major ground from 2016 to 2017. That seems to be true for the “pure” version of Arch Linux, but in parallel we see the derivatives/friendlier versions of Arch Linux (Antergos, Manjaro) growing very fast as well. Overall, such distros amount are chosen by 33.3 % of Linux gamers. While it’s entirely possible that Arch Linux and its derivatives are over-represented in the r/linux_gaming community, it does seem that it’s far from being negligible anyway, and helps to explain why even Feral tends to provide (unofficial) support for Arch Linux users. On top of that, the fact that Antergos and Manjaro are growing is certainly confirmed by the amount of press these distros are getting recently. I have seen a lot more articles mentioning their existence and comparing one to another in the past year than previously. OpenSuse is gaining users, while Fedora, Gentoo seem rather stable. 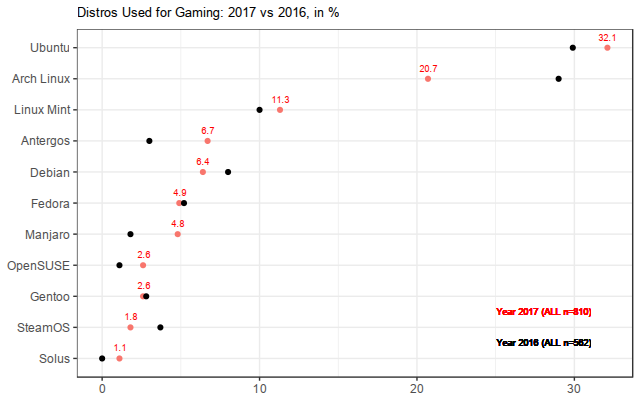 On the other hand, Debian seem to lose some popularity at least among gamers, and more interestingly SteamOS, a Steam gaming dedicated distro, seems to be decreasing in usage as well. I am certainly among such users who decided to drop SteamOS (for numerous reasons I mentioned before), and it seems that it’s not just me. Valve has been a lot more active to update SteamOS recently, so things may be changing (since they increased their AMD support as well) in the next wave. Finally, Solus was hardly a thing a year ago, and now it’s getting some love from a little more than 1% of Linux gamers. This new distribution is growing rapidly (along with its Budgie environment) and Ikey, its key developer, is now working full time thanks to sufficient Patreon support. Solus is also bringing some special features to better integrate with Steam (to let the user decide whether or not to use the Steam runtime or the distro libraries), so for gamers this can be another reason to look into it. So, overall the market for distros is not changing very quickly, but it still remains fairly dynamic especially among gamers who may care more about having the latest drivers and Mesa versions rather than looking for stability. Nice to see Solus in there! Btw, It’s Budgie desktop, not bungie. Will correct! Are you a Solus user btw? I am, the fact that it’s a stable rolling release with amazing QA and at the same time allows me to have up to date drivers and kernel makes it a dream for gaming. Are you missing anything since you moved to Solus? and how would you compare it to Arch ? Absolutely nothing. Some people complains about not finding in the repos obscure software, but that’s being worked on with flatpak support and a foreign package installer. They also didn’t like adding other desktop environments to the distribution,, but nowadays they are even working on Plasma. Suse is loosing? Look again please. But that’s not what the graph shows for OpenSUSE… It seems like it *gained* some popularity in comparison to the previous year. As someone not that hugely familiar with Linux, can you clarify this bit about Solus? What does it mean and how does it differ from each other? The Steam Runtime is a set of fixed libraries that are used for all Linux games on Steam. They make it easy to deploy games without having to worry about dependencies. Of course, since the set of libraries is fixed, you are likely to have newer versions of such libraries on your system if it is up to date. But Steam will ignore that. Solus gives you an option to use your system libraries instead of the Steam Runtime’s ones.